"Ah, those that don't believe in the sun down here are truly blasphemous," wrote Vincent Van Gogh in a letter to his brother Theo. Vincent arrived in Arles on February 20th, 1888 because he believed. He came for the light, hoping that its purity would provide similar dimensions to the Japanese prints that he loved so dearly. He stayed in hopes of creating a community of artists, an "Atelier du Sud" that would set a clear break from the soft glow of the Impressionist artists of the North. While his community failed, his art thrived and he painted over 200 oils and 100 hundred drawings within the fifteen months of his stay. It was to become the creative highpoint of his turbulent, short life and his masterpieces would change the path of modern art indefinitely. And yet surprisingly, in recent years there has only been one Van Gogh painting in Provence, tucked away in a private collection in Avignon. 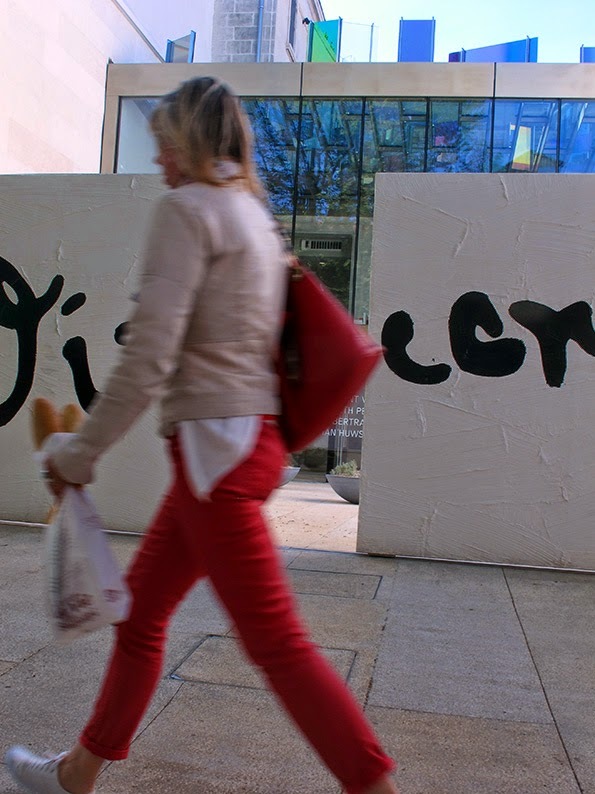 Visitors from around the world came to find Vincent and left with impressions only. Images written on the air. No more. 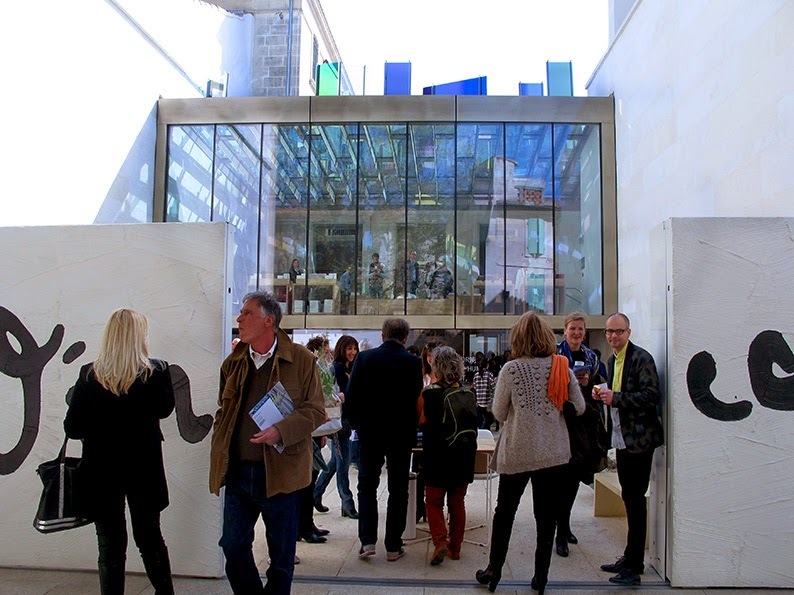 In 2008, a decision was made to take the "Association for the Creation of the Fondation Van Gogh" to the next level. 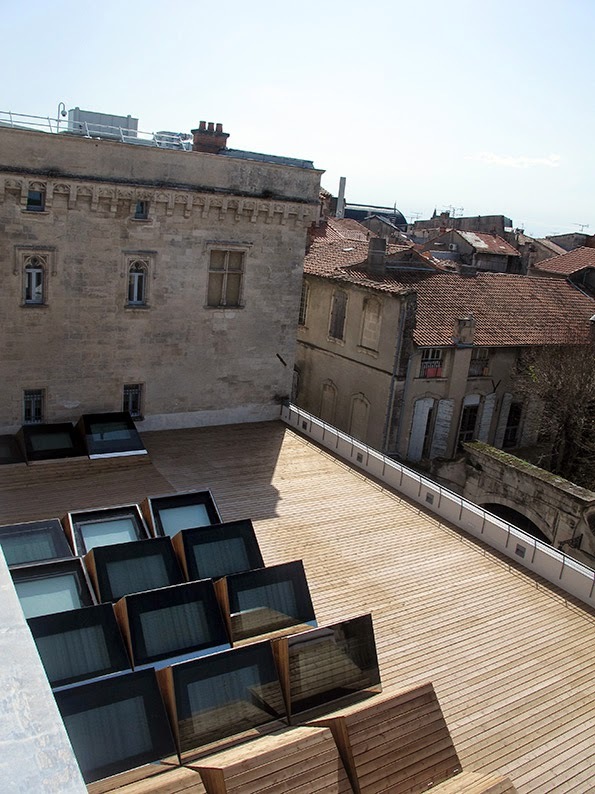 With the generous aid of art patron Luc Hoffman (who is also a founding member of the World Wildlife Fund), the Fondation was formed two years later and Hervé Schiavetti, the mayor of Arles, offered to house it in the 15th century Hôtel Léautaud de Donines. 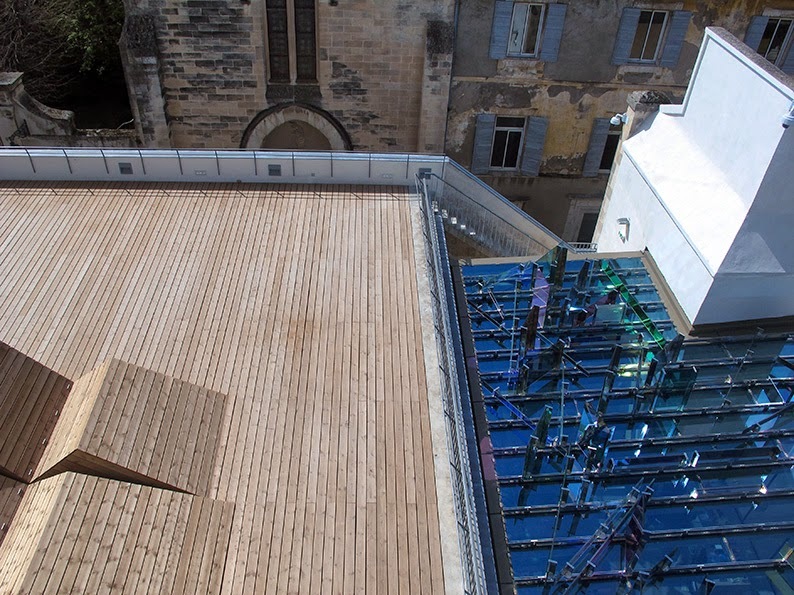 Architects Guillaume Avenard and Hervé Schneider of the architectural agency FLUOR were brought in to handle the delicate renovation of the space to work in conjunction of the strict regulations controlling the protection of Arles under UNESCO World Heritage Site status. 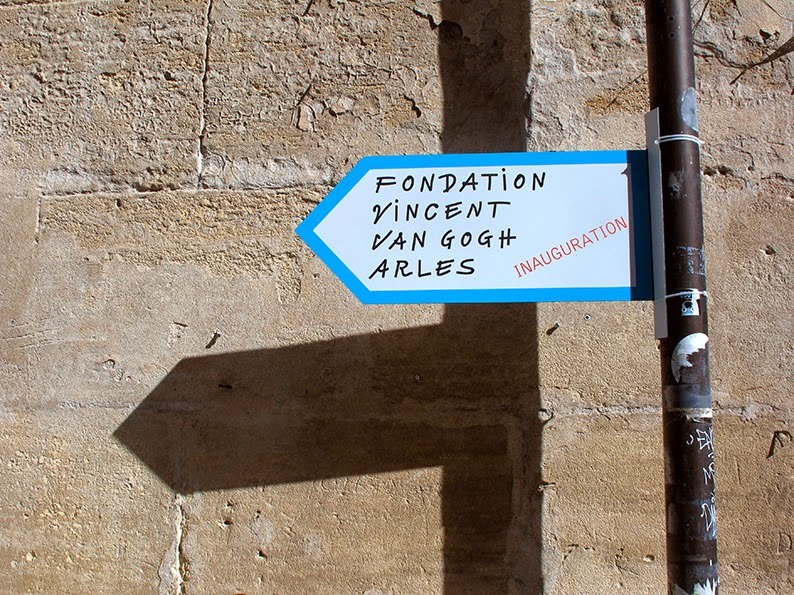 They too believed in Vincent's faith in the Provençal light and the resulting Fondation Vincent Van Gogh Arles, which opened it's doors to the public on April 7th, is a true merveille and a fitting expression of the artist's formidable vision. The Fondation's Artistic Director Bice Curiger and curator Sjraar van Heugten have collaborated on "Van Gogh Live! 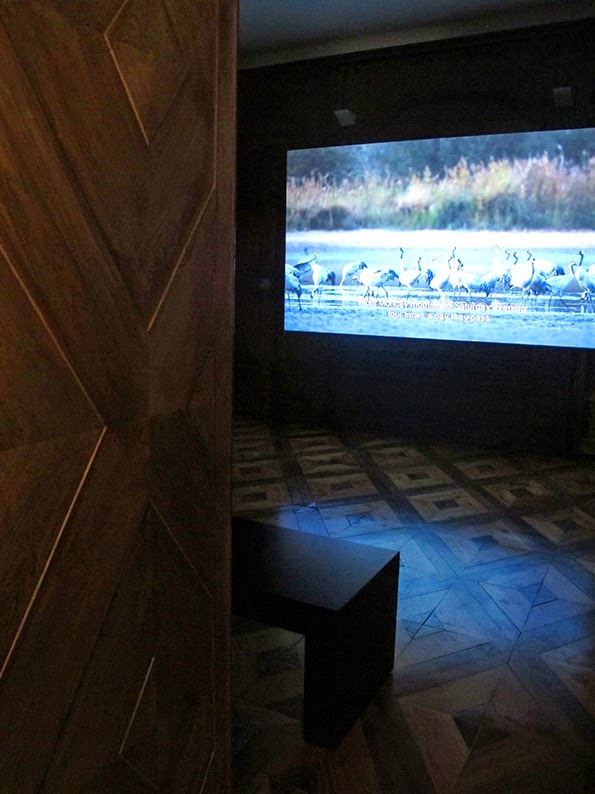 ", the opening exhibition, which is split into two parts. The first, "Colors of the North, Colors of the South" features works that trace the evolution of Van Gogh's color palette from his previous time in Paris to his exploration in Provence both by contemporaries that influenced him (there are gorgeous pieces by Courbet and Pissaro amongst others) to the paintings of Van Gogh himself. ...And how he then saw himself. The Van Gogh's present, on loan for the exhibition by the Van Gogh Museum in Amsterdam are breath-taking in their directness and expansiveness. For those of us who live in Arles, they can be quite moving to behold as well. Certainly that was the case for me in seeing "The Yellow House" in person after having looked upon so many facsimiles for so long. The brushwork is fascinating, as is the specificity of the coloration of that house that he built his future upon and which, unfortunately, was bombed during World War II and is no more. 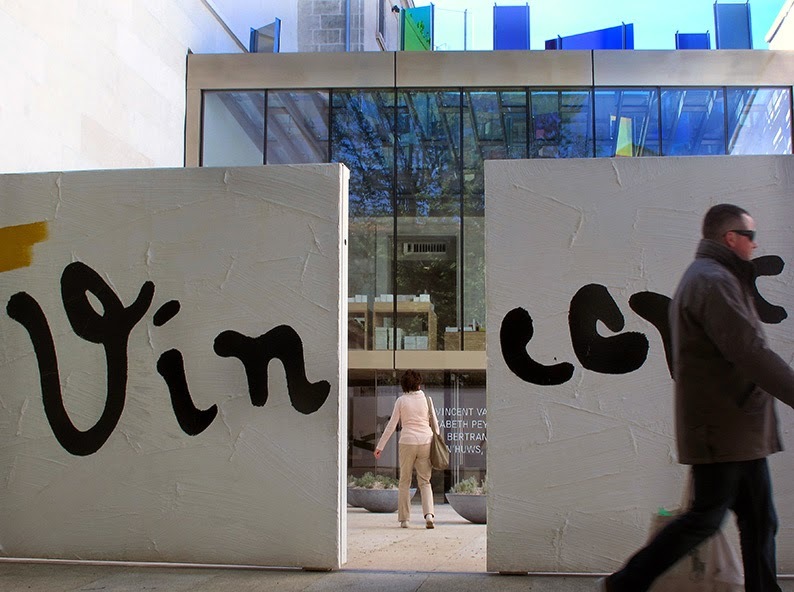 And yet, the Fondation is not only looking back into Vincent's past. 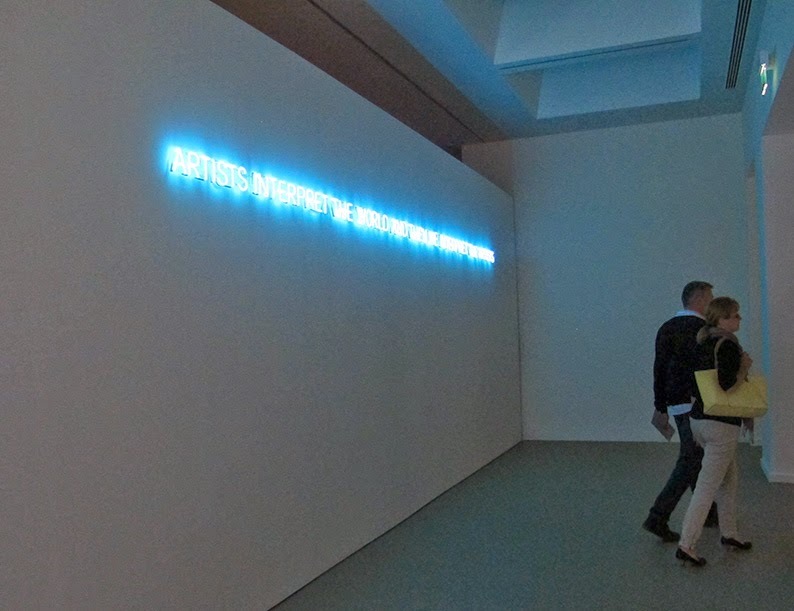 Far from it, they are also aiming to extend his presence into contemporary art as well. In the second half of the exhibition, nine international artists were invited to provide their interpretation of what that might be. 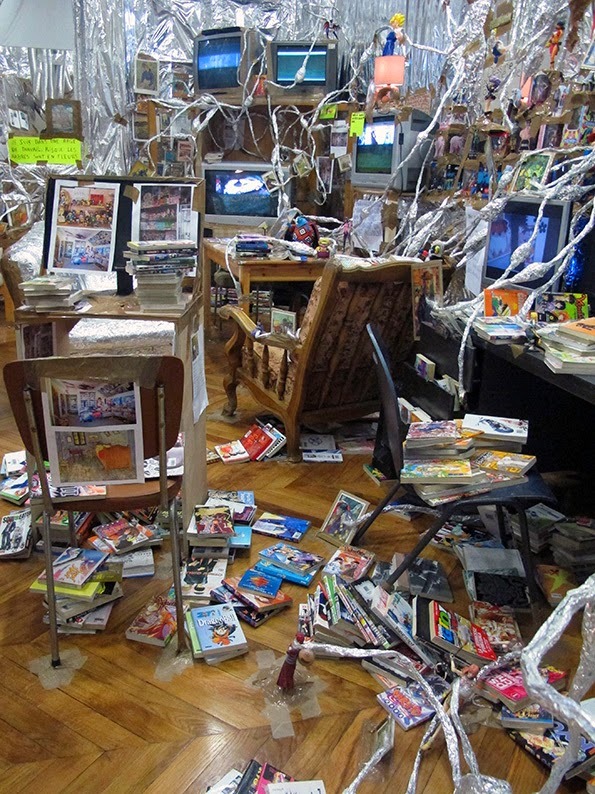 Amongst them, Thomas Hirschhorn's large scale installation especially fascinated the crowds during the opening. It portrays the world of a young Japanese woman who is so obsessed with Van Gogh that she becomes lost in the looking, all while embracing a "positive" side to her status as a "fan." On a far quieter scale visually, Camille Henrot approaches the question, "Is it possible to be a revolutionary and like flowers?" 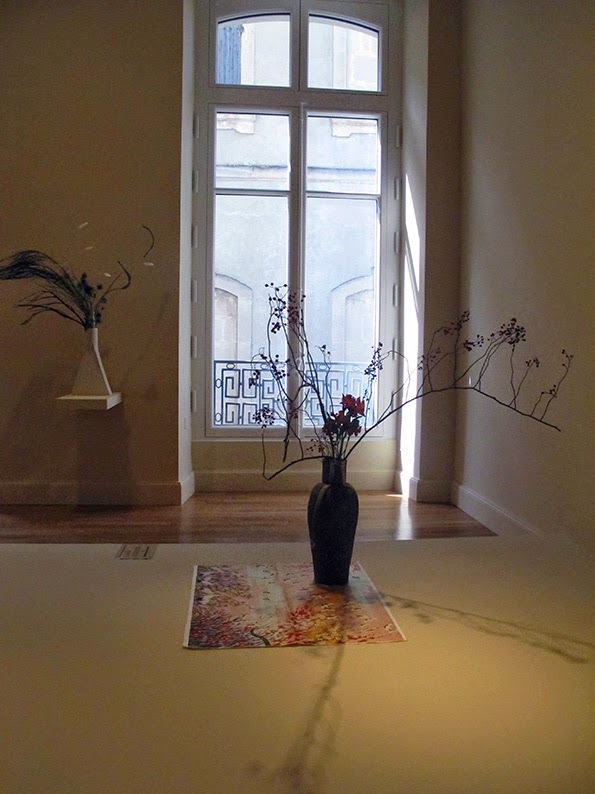 by exploring expressions of the Ikebana form of flower-arranging. Each arrangement was derived from a quotation concerning Van Gogh and the results are deceptively forceful. 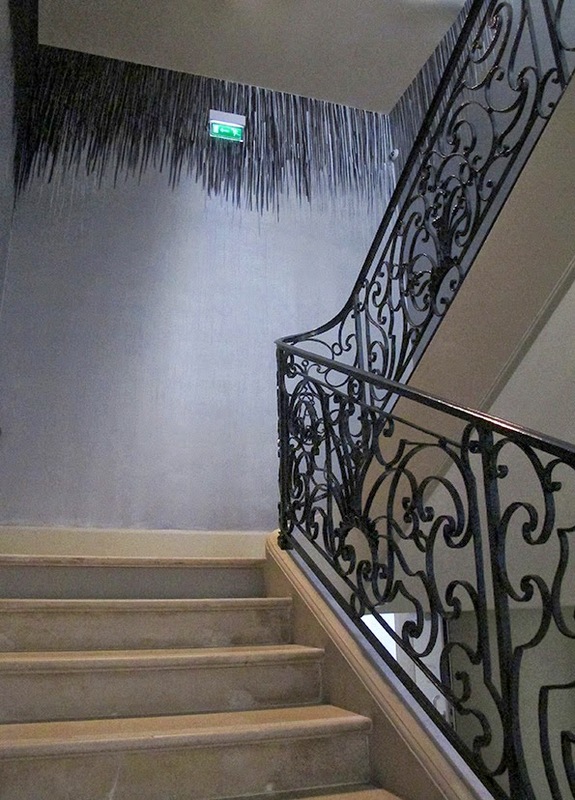 Percussionist Fritz Hauser recorded the scratches made on the walls of one of the Fondation's stairwells and transformed it into a sound installation called Schraffur or "Hatchings." But my personal favorite and most literal link to Van Gogh's artistic legacy came in the guise of the fluid and delicate paintings by Elizabeth Peyton. In their intimacy, you can almost feel Vincent breathing over her shoulder and guiding each movement of her hand. ...As well as a possibility to dive into the layers of both the exhibition and the experience of discovering this important new museum. 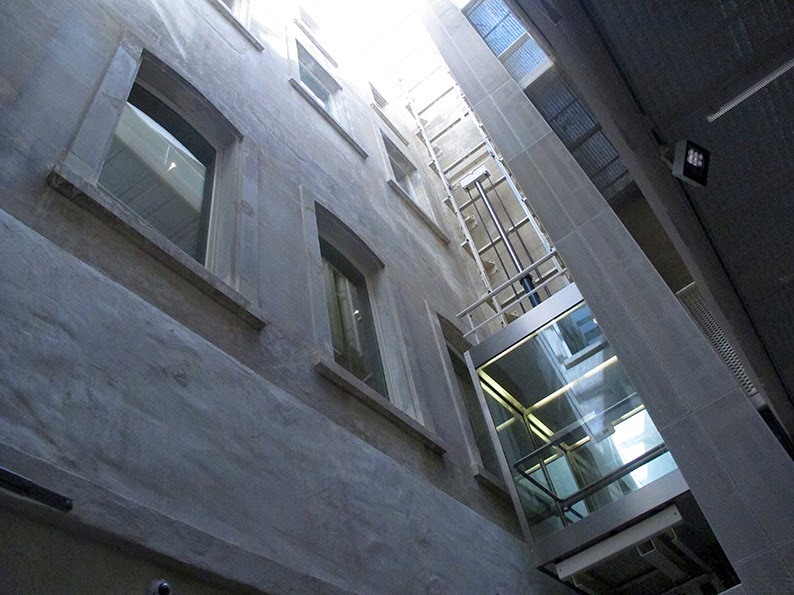 For the translation of this historic building into a contemporary museum is a work of art in itself. 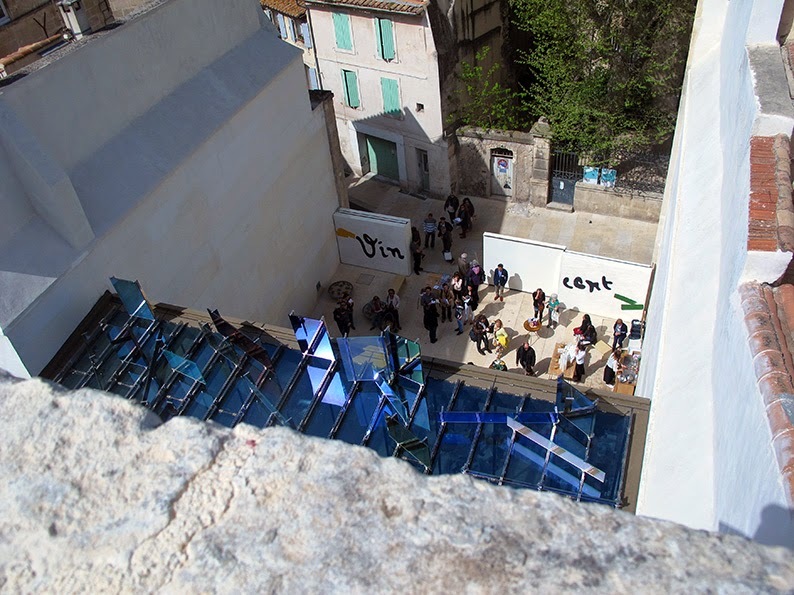 The incorporation of such elements as Raphael Hefti's prism-like reflective glass panels on the roof of the translucent facade as well as Bertrand Lavier's opening door - engraved with Van Gogh's signature - further make it so. 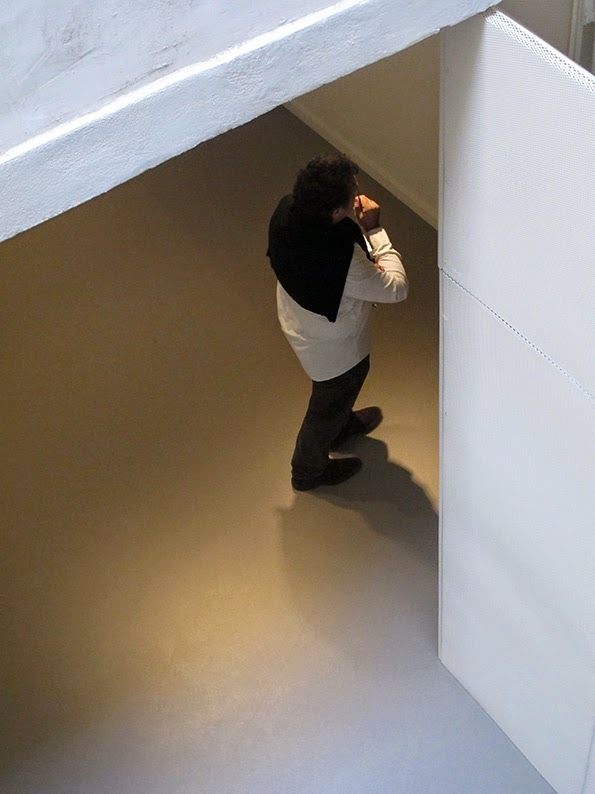 And yet, I found myself thinking as I wandered up to the roof terrace that there is nothing pretentious or precious in the presentation, something all to perfect for a foundation celebrating someone who is arguably the world's most popular artist. 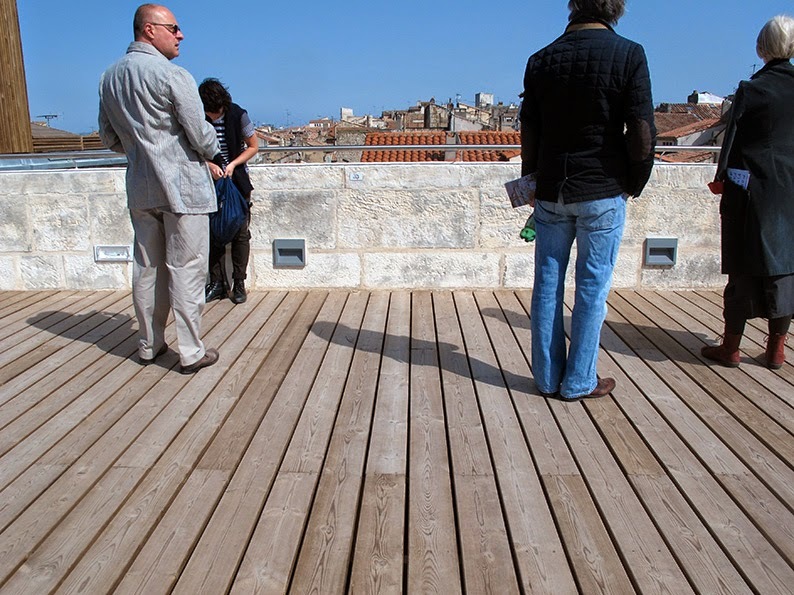 Along with the other visitors, I took in the delightful views over the rooftops of Arles. A view that has little changed since Vincent's time. A Mistral wind whipped around us and I couldn't help but wonder if it was Vincent's ghost, claiming victory, for once and for all. 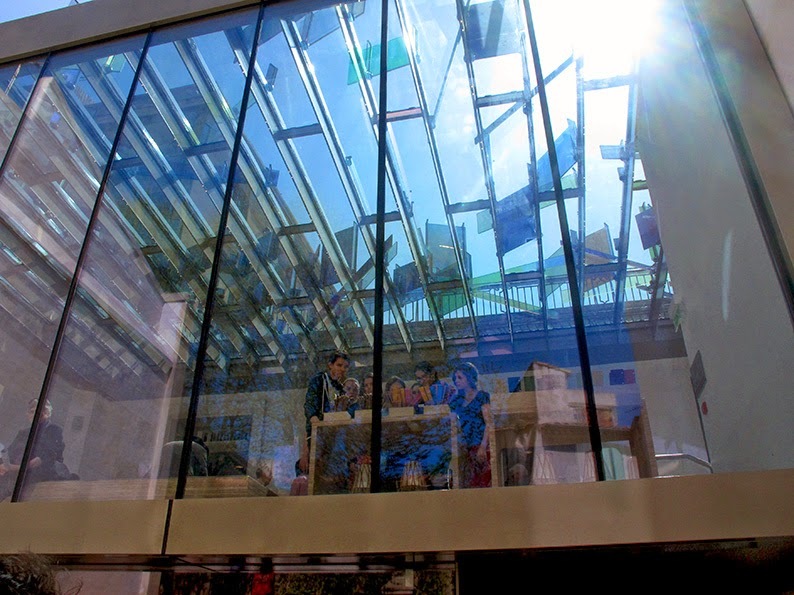 Down below, the visitors took in the sun of the courtyard and sipped ice teas provided for the occasion. There was no sense of frenzy, no pushing to see the masterpieces. If Vincent's ghost had indeed come to visit then certainly he was now welcomed...with peace. The crowds of that opening weekend have departed, widely proclaiming contentment along the way. I now pass the museum every morning while walking my dogs and nod at it quietly. It gleams in its newness and yet has already claimed its place in the history of this old town. With one foot in-between the past in the future, it is a great gift to Arles and a perfect tribute to the aesthetic of Vincent Van Gogh. Van Gogh Live! is on from April 7th to August 31st. I highly recommend seeing this exceptional opening exhibition. I've been anticipating this post all week and, of course, you did not disappoint, Heather. Merci for this look into the Foundation, I just wish I could see it in person. I guess that's just one more reason to return. And once more you've conjured up the "goose-bumpy" aspect of Arles with your observation about the Mistral. Here's hoping that Vincent's spirit is somehow aware of how much the world loves him now and is at peace. Now I'm going to take another wander through your post to make sure I didn't miss anything! Oh, be still my heart... Gorgeous, gorgeous, gorgeous... and you've made me miss France even more, one of the greatest pleasures (and treasures), the appreciation for art. What D.A. said! I don't know when I'll get to Arles (I hope to some day!) but in the meantime, thank you for this virtual tour. 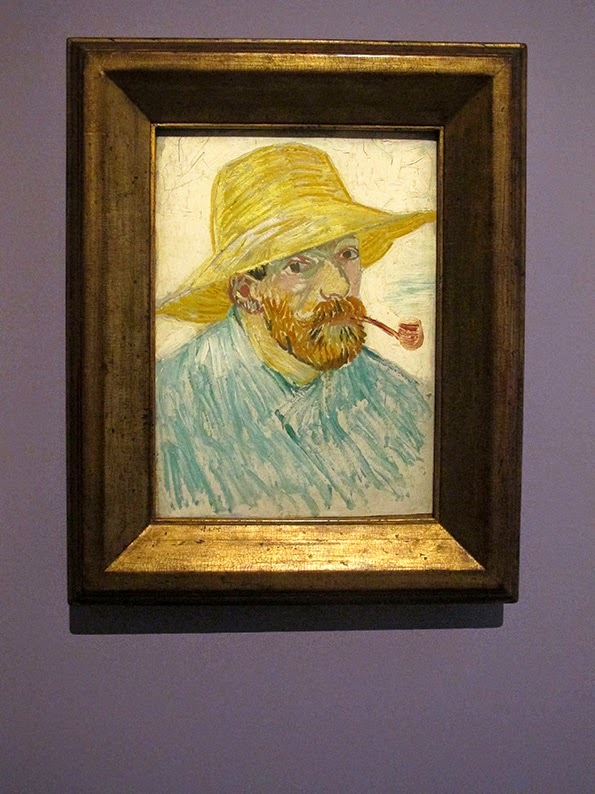 And, for reminding me how awestruck I was the first time I saw a 'real' Van Gogh at the Art Institute of Chicago during my freshman year at Northwestern. 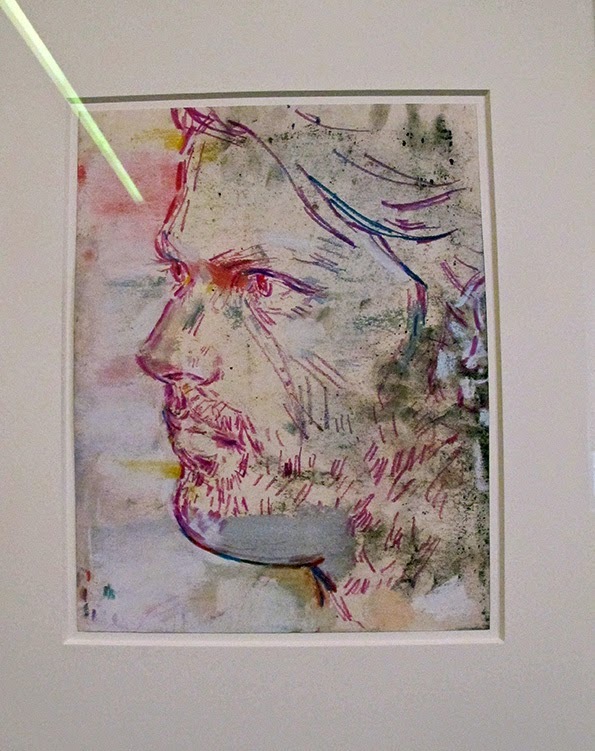 And, I LOVE Elizabeth Peyton, too. We saw her work at the New Museum in NYC a few years ago. I've been watching for this post. 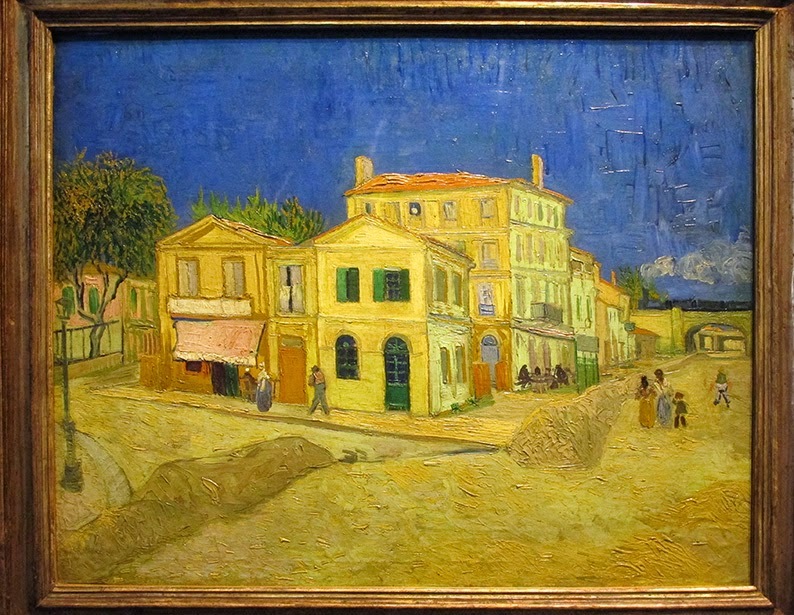 Such a lovely tribute to Van Gogh's time in Arles. 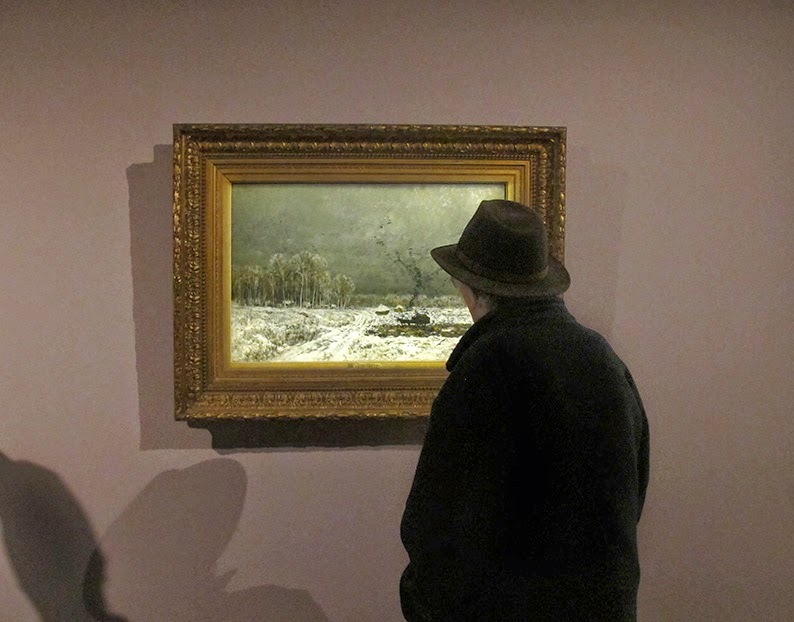 I loved seeing his works in the Musee d'Orsay several years ago. It's only fitting that his work should return, if not permanently, then from time to time, to its place in the sun. 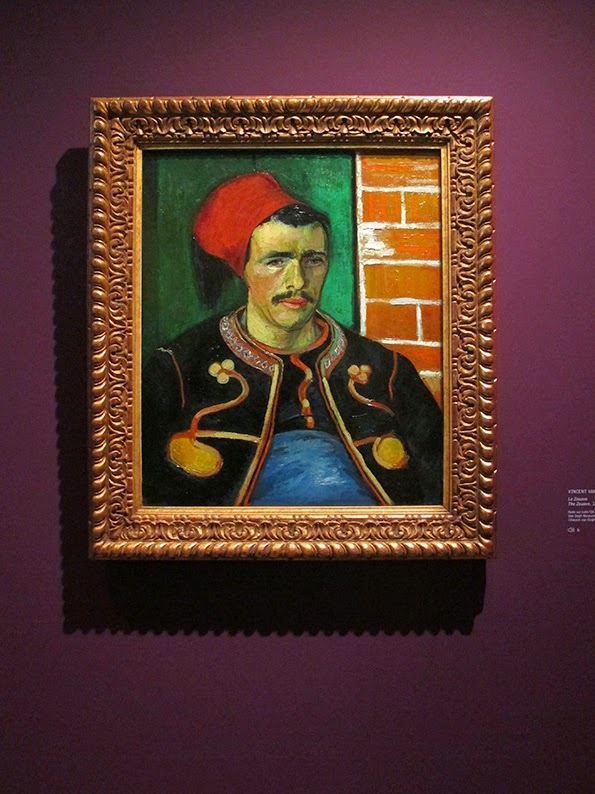 I dearly hope you can extract, on permanent loan, a dozen van Goghs from storage at Van Gogh Museum, Amsterdam. on the other hand, bad luck on Thomas Hirschhorn's large scale installation, which seems totally out of place. Hello Wilfred. My visceral reaction to the Hirschhorn installment was negative but the more that I have read about it since seeing it, the more that I see what he was trying to (and did) accomplish. 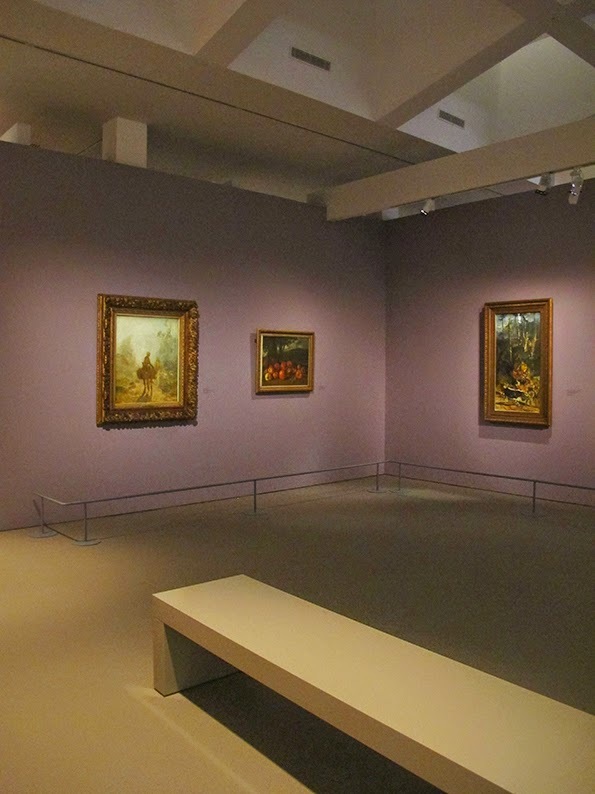 The French magazine L'Officiel even produced a seperate pamphlet that was handed out during the opening that was "a discussion" between the artist and the museum's artistic director. It really helped me appreciate the piece and it's importance in the exhibition, even if it is not an aesthetic that I appreciate personally. Splendid. I must find my way to Arles. I didn't appreciate van Gogh until I saw the "live" paintings in Amsterdam in 1959, with the vibrancy in the brush strokes giving them such color and dimension that just can't be conveyed in a "flat" reproduction. I felt the same about discovering them in NYC. 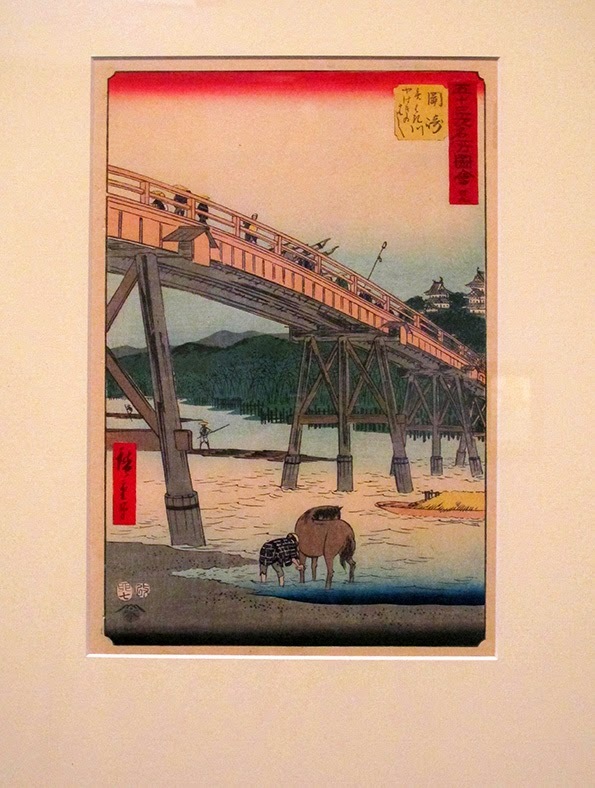 I have never seen a reproduction that even comes close to portraying the life in his work. How beautiful! The combination of old and new spaces is wonderful and there is a sense of peace and harmony, internally and externally. Lovely. I could look at "The Yellow House" forever...it's simply beautiful. "Is it possible to be a revolutionary and like flowers?" Oooh, sorry! I meant to include a caption for that! The piece is also by Bethan Huws and it says, "Artists interpret the world and then we interpret the artists" - you have to love that, non? Your writing and photos express your warm affection for Vincent Van Gogh. Is the "Yellow Room' inside the "Yellow House?" I became acquianted with Van Gogh for the first time when I read his Collected Letters to his brother,Theo, many, mnay years ago. BRAVO VINCENT………..BRAVA HEATHER………..and yes, I do believe that was his ghost "whipping" about! Van Gough was right about the light in Arles and Provence. It has a clarity and brilliance to it that I experienced and finally understood when I visited. It's just not the same in the Cote. Your reportage is perfect and now I can hardly wait to see the museum.. Thanks Miss! (Continued) of Vincent being ignored in his time and particularly here in Arles where he was ignored at best and scorned more likely by the locals...as one sees people strolling by the artist and the poker-faced model. The frenetic trembling of the artists hands and limbs while painting, performing was not appreciated by me until I saw the video and I imagine that VanGogh with his alcoholism and syphilis may have had some resemblance to this GIOM. Anyway, these were my feelings seeing the video and it held me there for a while in comparison to the actual event. The tangle of ducts and commercial products (Van Gogh Converse shoes and Barbie Doll museum editions), ear molds, etc was like being in a "fantastic voyage" through the dendrites of a brain damaged but still struggling and creating, nightmarish almost, or the tortured dream of the young Japanese girl who created this. Reminiscent of finding my place with notes written by and to the artist, as Stephen, the writer who had a few of these notes placed in the apartment, gouhlishly inspirational. Enough. Amazing museum. I lent my copy of Naifeh and White's Van Gogh biography to Stephen who was supposed to bring it to Arles, however he left it at home and I can't get it back now. Maybe ironic, maybe not. Our new SFR internet box isn't working but the signal from monbar is allowing me to use my iPad. Emotions will be tempered as jet lag wanes and it is great to be back again and using the salon again, finally. Looking for a redhead with two goldens! Several posts as I still encounter trouble with blogging! Good luck with the jet lag (I have done western U.S. to France a few times and wow is it tiring) and I am sure that we will run into each other soon. Too much distance between LA and Provence...bisous back. It is not nice to tease Jeanne! ;) Of course I would!! !